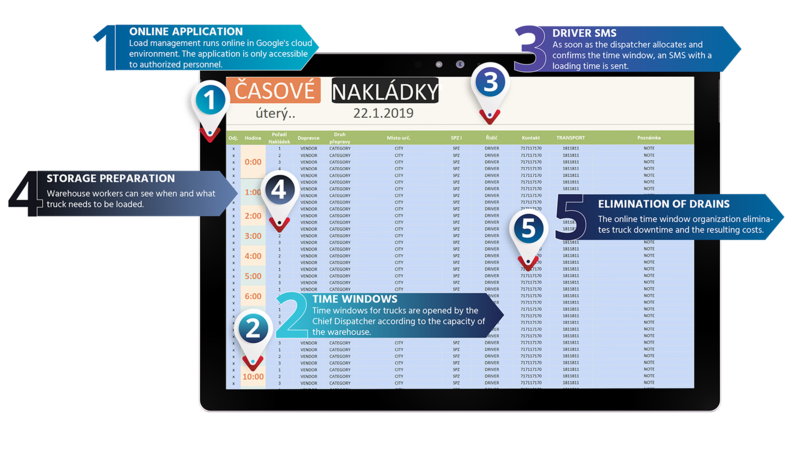 The online application for truck loading management eliminates idle time of trucks which arrive for loading too early or too late. We first developed this online application for our client whose communication about loadings was dependent on on e-mail communications between the logistics department and warehouses and telephone communications with truck drivers. It is a very cost-efficient solution. After setting and customisation to the needs of particular client it runs for free. Different client´s locations can be added modularly. The client who inspired us to develop this application has tens to hundreds of trucks arriving daily to his central warehouse. He also has several plants and external warehouses. The business of the client is subject to seasonality. In busy seasons communication between the departments concerned was not always sufficient. Empty trucks were accumulating on the site because the warehouse had capacity only for a certain number of loading ramps at a certain time. The app works online in the cloud environment on Google. It is accessible only to users who are granted access rights. The rights are assigned by the appointed administrator according to company’s needs. The dispatching supervisor opens a certain number of time slots in the application for each hour of the day. The opened slots correspond to the number of ramps that are available in the warehouse at the given hour. Subsequently, dispatchers assign time slots to specific trucks that are expected. The application tracks its history. So if a dispatcher assigns a truck to a specific ramp and time slot and then deletes the assignment, the application will have this recorded in its history. There is a special field in the application for filling in the phone number of the driver of particular truck. Once a dispatcher assigns the truck to a specific ramp and time slot, a SMS with loading time is sent to the truck´s driver. The overview of expected loadings from the app is also displayed at the entrance to the building, which all the drivers need to pass through. So, if the dispatcher did not know which particular driver is coming up and the driver did not receive the informational SMS, he can find all he needs to know right at the entrance. Warehouse staff have access to the application and its data as well so that warehouse supervisors know what trucks are about to be loaded or unloaded at what times. If necessary, access can also be granted to external companies. Our Trucks Loading Management Application is completely flexible. The cloud solution has no specific hardware requirements. It can include any client´s warehouse or plant. It can be customised to meet the needs of any company. We have over 18 years of experience with development of solutions which make the everyday operations in logistics and warehousing easier. The examples of such solutions include the Online Goods Arrivals Advice Application or Non-Deliveries Tracking Tool.